The descant rolls on and on from so many of my friends and peers; believers from all walks of life. The words are paced with shocking consistency. They are set to a meter like a metronome, the rise and fall undifferentiated. And it’s true, I can’t remember a time in my short life when things seemed this hotly debated and starkly contrasted in the “big C,” universal Church. We can barely even break bread with one another any more, and you can just forget about even suggesting we discuss some topic of significance while we feast on the bread and wine. But maybe, just maybe, Jesus knew it was going to be like this all along. Perhaps this is why He took the time to pray that we would be one and He and the Father are one. Perhaps we need only to look to the coronation procession of our King to see what kind of march His kingdom would have. Declares the prophet Zechariah as quoted in the book of Matthew. Have you ever seen anyone try to ride a donkey? Or just watched someone try to lead or direct a donkey to a certain location? It’s comparable to herding cats or catching chickens or getting small children to stand in a straight line, only it’s slower, smellier, more awkward and you may get kicked. Can you imagine how long it would have taken for Jesus to parade into Jerusalem? 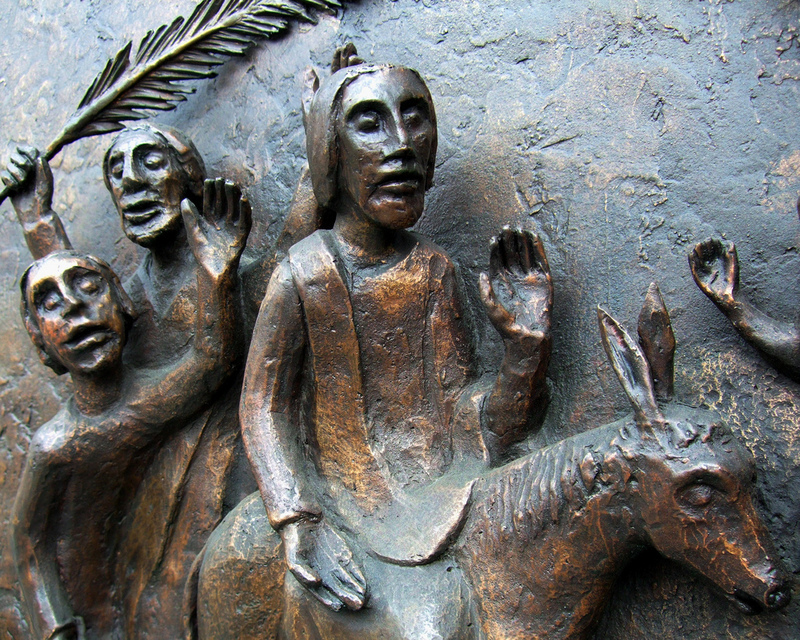 Did the donkey balk at the crowds, stubbornly refusing to budge in any direction? Was the animal braying loudly as the people cried “Hosanna!” nearly drowning their praise with its own contribution to the chorus? I’ve heard people talk about the significance of the donkey multiple times, how the donkey was a sign that Jesus was coming in peace, not with the political, militaristic take over they expected the Messiah to have. That the donkey shows us Christ’s humility. And these things are true. Maybe as He rides in on a donkey, Jesus isn’t just making a statement of peace or humility, maybe He is once more poetically, prophetically declaring “The Kingdom of God is like…” as He did so many times before. Like a kingly procession mounted on donkeys. Like a colt not yet ridden. I imagine the entry into Jerusalem looked less triumphant and more gauche. The Word that called the donkey into being now coaxing it one deliberate step forward at a time. Isn’t this what the Kingdom of God is like? That Jesus coaxes us forward, one step at a time? Slowly, graciously, with heart wrenching patience. This Kingdom does not come swiftly with domineering power and prestige, but slowly, with obstinance binding each move. The King gently nudging us along. As we step into a week of remembrance, I think back on the things I would rather forget in the history, and deny in the present, of the global Church. The oppression and violence of the Inquisition. Culpability with slavery and genocide on several occasions. Our affinity for segregation of many kinds. Yet, even in remembering the seemingly irreconcilable mess of misguided worship and injurious evangelism of my Kingdom, I find hope. Because the King is riding in on a donkey. This slow, awkward, reluctant gait is how Jesus chose to usher in the Kingdom in the first place. So we live in anticipation of the coming King and His beautiful, terrifying, upside-down Kingdom. We raise a ruckus and lay down the very clothes off our back because we can see in a distance the King is coming. …But He is riding on a donkey. When I read, “which sounds incredibly liken to another creature I know of that has been commissioned to carry Christ to the masses”, I laughed so loud Donnie asked what I was laughing at. From one whose donkey days will never be over, thank you.